Have you ever wondered why most of the world does not declaw cats? In nearly every country where cats are kept as companion animals declawing is illegal or effectively banned. In the U.S. and Canada onychectomy (declawing) is a booming business. 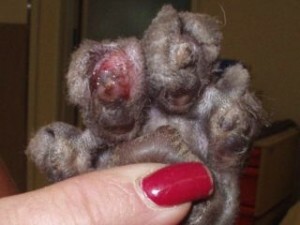 Recently a movement against this practice has been organized by a group called The Paw Project in California. So far four cities in our country have banned declawing (we have a long way to go, at least it’s a start). Cat caretakers perceive it to be a convenience. Most (but not all) veterinarians do not take the time to explain exactly what the operation involves and the possible side-effects, it’s also a money-maker. There is a general lack of knowledge as to why cats need their nails and how easily they can be trained to scratch on appropriate targets (posts). The humane community has a serious responsibility and unique opportunity to educate the pet parents about this inhumane practice. Relying on amputation as a means to manage normal cat behavior sets a dangerous precedent for our relationship with our companion animals. In many scientific journals declawing is accurately referred to as “elective mutilation”. Dr. Nicholas Dodman, Professor of Behavioral Pharmacology and Director of the Behavior Clinic at Tufts University School of Veterinary Medicine and internationally known specialist in domestic animal behavioral research explains why this is an appropriate term for this operation in his book The Cat Who Cried for Help. A study of 163 cats that underwent onychectomy, published in the Jul/Aug 1994 Journal of Veterinary Surgery, showed that 50% suffered from immediate postoperative complications, such as pain, hemorrhage, and lameness; and long-term complications including prolonged lameness, were found in nearly 20% of the 121 cats who were followed up in the study. In a study published in the January 2001 JAVMA, 33% of 39 cats that underwent onychectomy developed at least one behavior change immediately after surgery, with the most common problems being not using the litter box and biting. In a study published October 2001 JAVMA by Dr. Gary J. Patronek VMD, PhD., he states that declawed cats are at an increased risk of relinquishment. The good news is that scratching problems are 100% correctable! In over 20 years of behavior counseling, Cats International has never had a destructive scratching problem that could not be solved. It is the easiest behavior problem with which we helped people deal with. Drop the euphemism “declawing” which denotes a mere nail removal and call it what it really is—partial digital amputation. Explain that declawing is equivalent to amputating a person’s finger or toe at the first knuckle. Don’t forget the severe pain the cat will have through out it’s life. Inform the cat owner that declawing can result in some very unpleasant changes in personality and behavior. 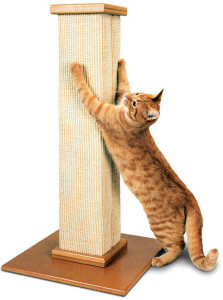 We recommend the Ultimate Scratching Post™ from Pioneer Pet®. 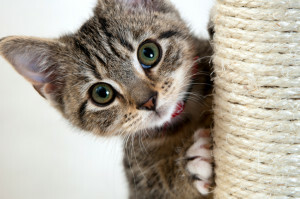 You can make your own by referring to our article “How to Build a Scratching Post”. A good work-out on the scratching post is the equivalent of a vigorous session at the gym for us. Demonstrate how easy it is to trim a cat’s nails. If you are adopting a cat or a kitten to a new home, explain to the adopters the importance of claws to a cat, find another home if they insist on declawing. Your efforts will not only improve the quality of life for the cat or kitten that is being adopted, but you are also reducing the possibility that the cat will be returned to you due to a declawing-related behavior problem. It is also a great opportunity to help educate someone on what de-clawing really is, hopefully they will tell other people how crewel and crippling it is to the cat. Spread the Education! Claws are essential to the well-being of the cat. 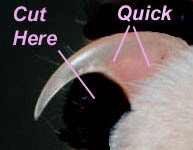 The cat’s unique and amazing retractile claws enable him to use their claws when in danger and then tuck them safely away when they are not needed. The claws also allow the cat to grasp and hold objects as well as establish footing for walking, running, springing, climbing and stretching. 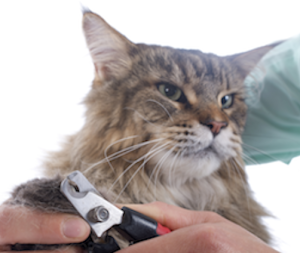 By regularly trimming your cat’s claws and offering a suitable scratching target (post), you are providing a natural outlet for a normal, happy and healthy behavior and you will be rewarded with a satisfied and confident companion. *Note: Many apartment managers who previously required cats to be declawed are accepting Soft Paws vinyl nail caps or the evidence of a good scratching post. We at Cats International would find a suitable place to live that would let our cats keep what they have been born with….their NAILS!